Are you looking for a low maintenance, quick growing vine to cover an unsightly fence or wall? Or perhaps you just want to attract more birds and butterflies in to your garden. Try a Queen of Sheba trumpet vine. Continue reading to learn more. 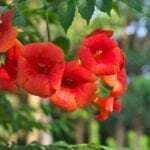 Queen of Sheba trumpet vine, also known as Zimbabwe creeper or port St. John’s creeper, is not the same as the common trumpet vine (Campsis radicans) that many of us are familiar with. Queen of Sheba trumpet vine (Podranea brycei syn. Podranea ricasoliana) is a quick growing evergreen vine in zones 9-10 that can grow up to 40 ft.
With its glossy green foliage and large pink trumpet-shaped flowers that bloom from late spring to early fall, Queen of Sheba vine is a stunning addition to the garden. The pink flowers are very fragrant, and the long blooming period draws hummingbirds and butterflies to the plant by the number. Podranea Queen of Sheba is a long lived vine, known to be passed on in families from one generation to the next. It is also reported to be a very aggressive and even invasive grower, much akin to the common trumpet vine’s invasiveness, smothering out other plants and trees. Keep that in mind before planting a Queen of Sheba trumpet vine. These pink trumpet vines will need a strong support to grow upon, along with plenty of room away from other plants where it can be left to grow happily for many years. 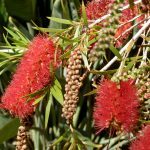 Queen of Sheba vine grows in neutral soil. Once established, it has little water requirements. Deadhead your pink trumpet vines for more blooms. It can also be trimmed and pruned anytime of the year to keep it under control. Propagate Queen of Sheba trumpet vine by seed or semi-wood cuttings. Read more articles about Queen of Sheba.